In the case of Trump, it can be seen that he uses words associated with those of The Philosopher, but not consistently enough for the archetype to register on its own. That is why there is no evidence of The Philosopher archetype on the bottom left. Nonetheless, the absence of the archetype is important to see. 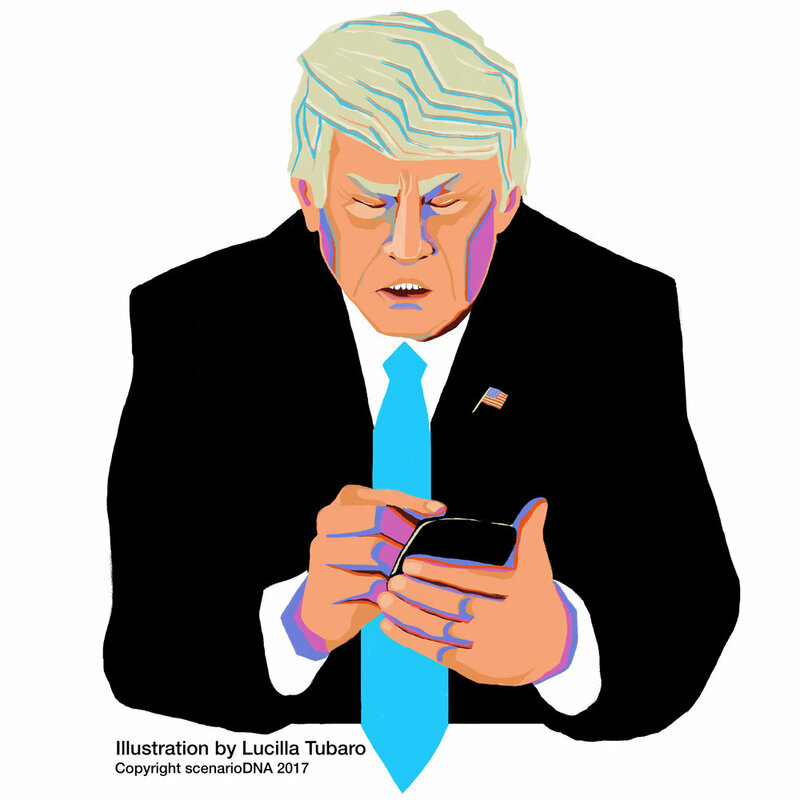 Although Trump’s tweets fall across four archetypes: The Philosopher, The Protester, The Publicist and The Policy Maker, the most significant void is the archetype of The Philosopher. The Publicist is dominant in his conversation throughout the 100 days. The words of The Protester archetype are not used as much by him as one might expect. Their erratically patterned releases are what makes this word pattern and its archetype stand out. Hyperbole comes with the territory of The Publicist archetype. Trump certainly understands the cause and effect of his words, and knows how to deploy the least effort for the greatest response. That said, it is not extremely surprising that Trump’s Administration is and will likely continue to be marked by themes of (self) promotion and connection. 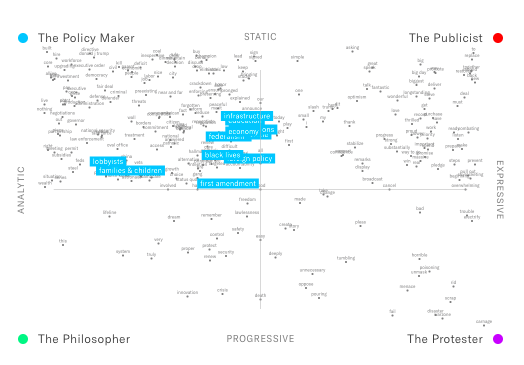 The words of The Policy Maker archetype put forth an interest in and aptitude for developing strategies and policies. The intent is seriousness, but his words of authority are more frequently peppered with hyperbole than not. Because people use words and visual language to express their thoughts, language use reflects their thinking. Thus, analyzing someone’s language lends considerable insight into that individual’s thought processes. One way to analyze language use to better understand thinking processes, including priorities, goals, motivations, and strategies, is through culture mapping. Culture mapping allows tangible visualization of cognitive frameworks and evolving cultural trends and tensions, in turn providing strategists from all disciplines with vital information for helping grasp social and consumer perceptions. In employing our method of culture mapping, a patented semiotic process, we objectively observe and analyze signs and symbols put forth by individuals and organizations, rendering people’s thoughts, expressed primarily through their language use, visible. Once an individual’s or group’s underlying tendencies have been mapped, we can predict that future behaviors will follow the trend identified. We have used this method successfully since 2001 to unlock archetypes by identifying clusters of similar language used, then analyzing each cluster to ascertain an overarching cluster archetype. We then compare the uses of each archetype in terms of frequency and patterns over time. This method has proven successful in forecasting many social trends including television programming, urban planning, product innovations and politics. To illustrate our culture mapping method, we analyzed the language of President Trump with the goals of identifying his (possibly unstated) positions and forecasting his likely future directions. We drew our data from Trump’s Twitter feeds @realdonaldtrump and @potus during his first 100 days in office, beginning January 20, 2017. We first used the signifiers within his tweets to classify them and identify primary archetypes. Trump drew persistently from four archetypes. We found that over time, Trump’s preferred archetype changed. When Trump first entered office, he was mainly driven by The Publicist, relying on themes of promoting and connecting. As days moved on, The Protester archetype began to push forward with manifestations of exposing and judging. As he begins to move through executive actions and Congressional meetings, The Policy Maker begins to show as he exerts framework and control. The Philosopher, reflecting faith and wisdom for the long history of the Office and his prescribed role, represented the most notable void while The Publicist archetype dominates his social media conversation over the 100 days. And, we took a closer look at how he talked about the topics he addressed, by labelling tweets by issue to see how they clustered. For example, Trump routinely discussed drugs, leaks, refugees and immigration as problematic. More specifically, he expressed judgment and encouraged exposing against the current structures in each of these areas. Thus, we find these together under the archetype of The Protester. From these findings, we can predict that if the current pattern continues, we are looking at an Administration driven primarily by connecting and promoting, and barely alluding to ideas of faith and wisdom. To further emphasize patterns, the colors throughout the culture map correspond with the archetype identified, explained in a moment. In the culture map timeline, we categorized each tweet as positive, neutral, or negative to see where the archetypes fall emotionally. The size of each circle representing a tweet in the timeline reflects the number of times it was retweeted by Trump himself and the Twittersphere. Interestingly, 45% of Trump’s retweets are Trump retweeting himself, a pattern consistent over time and bolstering The Publicist archetype, reflecting his own self-connection and self-promotion. Our culture mapping tool transforms these hunches into scientific evidence. As individuals living in a society under his leadership, these archetypes can leave us less surprised when they appear in his communications, and we can better understand Trump’s motivations when he infuses his language with these themes. If we are savvy to recognize and process these archetypes as they arise, we are less likely to be swayed or unearthed by them. Thus, the predictive value of our culture mapping tool helps lend greater insight into the ideology and motivations of our current leader as he progresses through his time in office and the events he will face. This example illustrates that applied to other instances of language use, such as consumer behavior, the insights provided by our culture mapping tool help isolate and identify current trends and lay firm groundwork for predicted future behavior.